Zimbabweans march as Mugabe’s future in the balance – Royal Times of Nigeria. Thousands of protesters flooded Zimbabwe’s streets demanding Robert Mugabe’s resignation on Saturday in a movement organised by independence war veterans and backed by ruling party barons and the army. 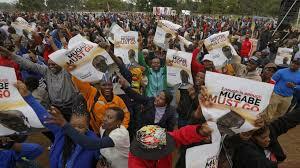 The mass turnout came after an unprecedented week which saw the army’s top brass seizing power and putting Mugabe under house arrest in response to his sacking of Vice President Emmerson Mnangagwa. It was a stunning turnaround for Mugabe who has ruled Zimbabwe with an iron fist since 1980. 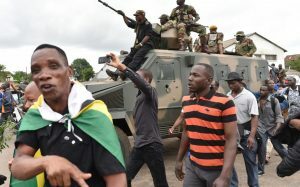 Veterans of the liberation war, who had previously supported Mugabe, had called for the gathering which saw marchers rallying in Highfield, a working-class suburb of Harare, with another demonstration staged in Bulawayo, Zimbabwe’s second city. “This is the best day of my life. We are hoping for a new life after Mugabe,” said 38-year-old Sam Sechete who was marching with a crutch. A symbolic location, Highfield was where Mugabe gave his first speech after returning from exile in Mozambique ahead of independence in 1980. Such an open display of disloyalty would have been unthinkable just a week ago as dissent was routinely crushed by security forces. In a statement released on Friday, the army said it fully supported the protests. “Today is independence, we are suffering too much,” said 14-year-old marcher Grace Kazhanje. Emma Muchenje, a 37-year-old market worker, said she had skipped work to be at the march. “This day took too long to come,” she told AFP. There was an atmosphere of celebration among the crowds with protesters cheering the soldiers and stopping to shake their hands. By 0800 GMT, several thousand people were at the scene, AFP correspondents said, although buses bringing more demonstrators were continuing to arrive. A separate #ThisFlag march led by anti-Mugabe pastor Evan Mawarire will head to State House in Harare while other rallies are to take place elsewhere around the country. Mugabe enraged many Zimbabweans when he failed to resign following talks with the army’s top brass on Thursday, with sources suggesting the veteran leader was “buying time” to negotiate an end to his 37-year reign. 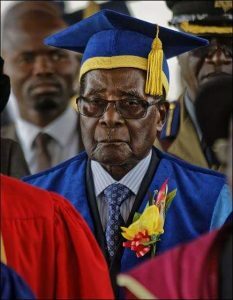 He appeared publicly for the first time on Friday at a pre-planned graduation ceremony in Harare, further stoking speculation about his talks with General Constantino Chiwenga, who led the military power grab. Later on Friday, eight of the 10 regional branches of Mugabe’s ruling ZANU-PF took to state television to call for him to go — yet another a serious blow to the embattled leader. “Thousands for Mugabe ‘final push’,” blared the front-page of the News Day Weekender while the Daily News lead with: “Mugabe cornered”. “The game is up,” said Chris Mutsvangwa, chairman of the independence war veterans’ association which organised the Highfield protest. “It’s done, it’s finished… The generals have done a fantastic job,” he said. Mawarire, the outspoken Mugabe critic who rose to prominence last year with his #ThisFlag protest movement against the president, called on Zimbabweans of all backgrounds to march with the war veterans. In their Friday statement, Zimbabwe’s military chiefs said their operation to round up “criminals” in Mugabe’s government was ongoing. Their seizure of power appeared to be the climax of a dispute over who would succeed the veteran leader. Before being pushed out, the vice president had clashed repeatedly with Mugabe’s wife Grace, 52. Both had been seen as leading contenders to replace Mugabe but Mnangagwa had the tacit support of the armed forces, which viewed Grace — a political novice — with derision. The United States has called for the Zimbabwe army to quickly relinquish power. “We all should work together for a quick return to a civilian rule,” said US Secretary of State Rex Tillerson ahead of talks with African foreign ministers.